Thomas Osborne of Henrico left a personalty calculated to be worth one hundred and twenty-five pounds sterling not counting all of the clothing and live stock of the estate. 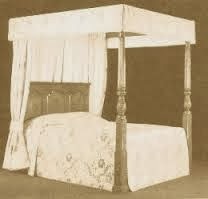 His house furnishings consisted of the best of the era, including feather-beds, pillows, curtains and valance, a blanket and worsted rug. The apartment known as a lodging-room contained a bedstead, feather bed, bolster, yarn rug and blanket, cupboard and chest, two Dangzic cases and a small trunk.